Want to know why Le Marche is so special? Despite being little know outside of Italy, there is so much to see and do. Certainly something for everyone in this wonderful region. Unspoilt, full of history, the most friendly people and dazzling views around every corner, you will want to come back time and time again. Here are just the top 50 of our personal favourites at The Hideaway. 2. Spend a lazy Sunday lunch at the wonderful Il Tiglio with chef Enrico. 4. Take a wine tour at the fascinating Murola Winery. 5. Go on an adventure in the forest with Marco and his beautiful donkeys of Smerillo. 6. Take a pasta making course at La Conca with the fantastic Mirela and dine there too. 9. Find out all about copper production & maybe buy a pan to last a lifetime at Tanucci’s Comunanza. 10. Take a ride on horseback round the beautiful San Ruffino Lake. 11. Visit the stunning Frasassi Caves – perfect for a rainy day! 12. Have a look at Bozzi pottery being made and maybe take a piece home for yourself. 13. Stroll round ancient Ascoli Piceno & look out for the inscriptions over the doors – there are over 200! 15. Go truffle hunting in the woods near The Hideaway or in November visit the Amandola Truffle Festa. 16. Visit the Chiesa di Santa Maria Della Rocca in Offida. 17. Take a guided tour of our nearby town of Amandola. 18. Go exploring San Ruffino Lake by kayak! 20. Visit Fermo and the Cisterne Romane, underground cisterns dating back to Roman times. 21. Take a trip to the Conero National Park and be amazed at the beaches. 22. Whilst at the Conero, eat the freshest muscles ever on Portonova beach. 23. Visit the stunning Basilica di San Nicola in Tolentino. 24. Explore the fascinating Grotti di Osimo caves. 25. Eat pizza in our local favourite Bella Napoli in Amandola. You won’t find better! 26. Visit Le Senate, a new winery in the area and discover a small but perfectly formed vineyard. 27. Take in an opera at the Sferisterio in Macerata, perfect on a summers evening. 28. Sniff the aromas of award winning Perfero Caffe near Altidonna & see the beans being roasted. 29. Watch pasta being made & buy some at Campofilone where it has been made now for over 100 years. 31. Go to Mazzumaja (dialect for kids making a mess) a huge music event in Comunanza in July. 32. Visit Castello Pallotta in Caldarola. The most perfectly formed castle full of interesting articles. 33. Go factory outlet shopping to some of the biggest names in fashion including Prada, Tods & Armani. 35. Laze by the side of the deep blue waters of Lago di Fiastra or take a dip in the cooling waters. 36. Ski at Sassotetto or Madelena – perfect for beginners and the more experienced alike. 37. Travel north and visit the wonderful town of Urbino, a UNESCO World Heritage Site. 38. Visit the Casa Leopardi – the home of Giacomo Leopardi in Recanati. 39. Take a tour round the ancient site of Urbisaglia and the archeological park and castle. 40. Don’t miss Fabriano, famous for its paper making. 41. Visit the International Museum of Hats in Montappone and grab yourself a bargain. 43. Wonder round the Museum in Amandola and find out about ancient traditions of the countryside. 44. Visit the ancient town of Gradara and its beautiful castle. 45. Stroll around one of the many town markets which are held nearly every day and pick up a bargain. 46. Hike up the Golla dell’Infernaccio or Hells Gorge and be amazed at the beauty and peace. 47. 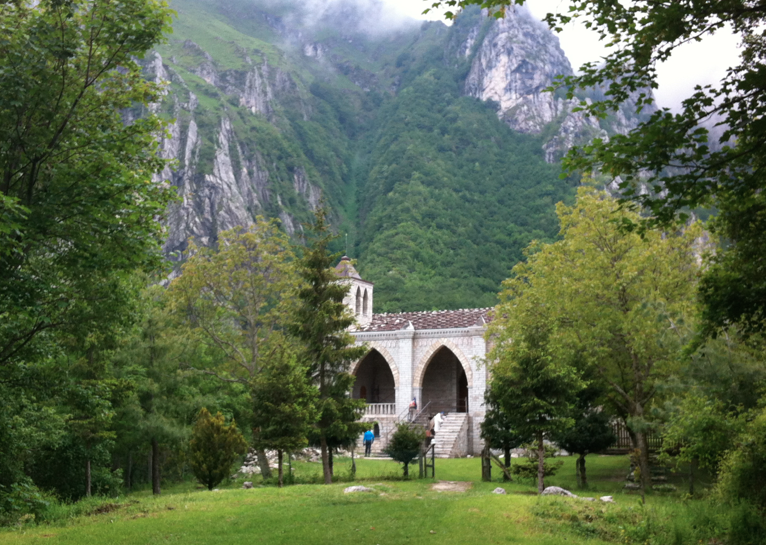 Whilst at Golla dell’Infernaccio, take a detour & visit Padre Pietro at the L’Eremo di San Leonardo. 48. Not strictly Marche, but in neighbouring Umbria – don’t miss the Fioritura in Castelluccio. 49. Get along to one of the many festivals and events held year-round and join in the fun. 50. Winning the award for best pizza maker 2012, visit Mamma Rosa, Ortezzano for a real treat. Oh and there are just so many more to discover! So come on over to Le Marche and see for yourself.